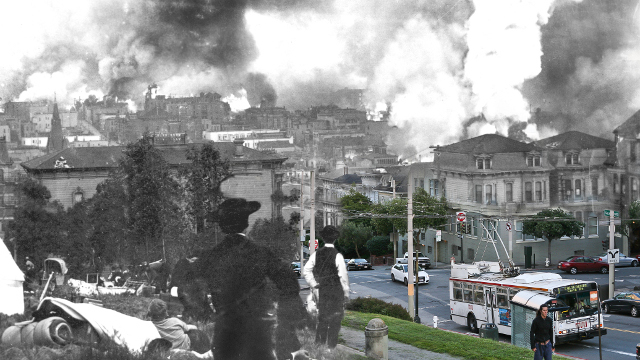 A mashup of San Francisco’s Pacific Heights neighborhood right after the 1906 earthquake and what the area looks like today. Mention sleeping in Golden Gate Park, and most people think of homelessness. But the idea that San Francisco’s most famous park could be used as an emergency shelter for thousands of victims after a major earthquake – as it was after the 1906 earthquake – is again resurfacing. Public Architecture, a San Francisco non-profit organization, recently asked three architecture and design firms to devise resiliency plans for the city that could be put in place as soon as next year and explore creative ways San Francisco could respond to natural disasters. With everything from urine recycling to art installations that indicate areas at risk for earthquake liquefaction, tsunamis and floods, the firms drew up a variety of innovative strategies. One of the plans, from San Francisco-based CMG Landscape Architecture, looks to the 1906 San Francisco earthquake. That catastrophe killed at least 3,000 people, destroyed more than 28,000 buildings and left 225,000 people homeless. After the 7.6 magnitude earthquake hit, many victims flocked to the Presidio—then a military outpost—and to Golden Gate Park for refuge. At first, tents were constructed, but as winter approached, soldiers from the Army built small houses that provided shelter for more than 16,000 survivors. CMG believes the Park can once again support many thousands of people, if necessary. “We’re in earthquake country and it can be the elephant in the room—we know it could happen but we want to ignore it,” said CMG design leader Scott Cataffa. CMG proposes new waste treatment facilities, emergency-response infrastructure and energy supplies by lining the Park’s polo fields with dry-composting restrooms and first aid stations. The restrooms would divert treated wastewater onto nearby turf for use as a natural fertilizer. An on-site, sand-filter water treatment system also would serve as a 100-foot tall water tower and viewing deck. The observation deck, covered with solar panels and a modern-day windmill, would allow people to survey the surrounding area. Dutch and Murphy Windmills that already exist at the Park would serve as a back-up power source. By integrating large-scale sanitation-systems, water treatment infrastructure and a water tower, the park could support up to 12,000 people, Cataffa estimated. There is already a precedent for Golden Gate Park supporting a large influx of people in the 21st century. Annual events, like the Outside Lands music festival, draw hundreds of thousands of fans into the park during the summer. In fact, CMG officials believe that public events are ideal opportunities to teach disaster preparedness and encourage a sense of community among attendees. “During Super Storm Sandy, some communities had fewer economic resources but knew each other better and they looked out for each other,” Caffata said. Next April 18, on the 108th anniversary of the 1906 earthquake, CMG proposes a “Camp the Park” event. Interested San Franciscans would spend the night in Golden Gate Park to test the city’s ability to mobilize and prepare for disaster response while meeting neighbors and learning about survival techniques. Corporate sponsors would provide the funding while the San Francisco Recreation and Park Department would need to approve the event and any structural upgrades. However, not everyone thinks it’s a good idea to herd thousands of people into Golden Gate Park after the next major earthquake. “Our first choice is to keep people in their homes, not in a city that gets built in Golden Gate Park,” said Lt. Erica Arteseros, program coordinator for the San Francisco Fire Department’s Neighborhood Emergency Response Team. Arteseros’ program, formed after the 1989 Loma Prieta Earthquake, allows roughly 2,000 people a year to receive 18 hours of disaster preparedness training from San Francisco firefighters and emergency responders. The San Francisco Planning and Urban Research Association, a non-profit planning group, has published a “Safe Enough to Stay” report that details what it would take to make people’s homes suitable as shelters after an earthquake. If residents can stay in their homes, the process of rebuilding the city can begin much sooner, according to the report. Even so, after a magnitude 7.0 earthquake or greater, many people would be left homeless. In that scenario, the San Francisco Department of Emergency Management would work with the Red Cross to set up temporary shelters and use large spaces like the Bill Graham Civic Auditorium to provide longer term housing. For all San Francisco’s current planning, CMG and Public Architecture say they are not evaluating optimal conditions. They anticipate a future that is hard to imagine and even harder to predict. For all the right things being done, it is hard to believe that San Francisco really takes the threats seriously as long as they continue development of Treasure Island that will inevitably be lower than sea level.